Sardo Canale, as its name suggests and its menu amply confirms, specialises in Sardinian food. In its cavernous basement kitchen chef Claudio Covino cooks vibrant dishes from Sardinia, Italy’s second-largest Mediterranean island. A popular dining spot on Primrose Hill’s celebrity circuit, Sardo Canale is an interestingly tiered restaurant housing four disparate dining areas, one of them an intriguing relic of Primrose Hill’s rags-to-riches past. Furnished with plump banquettes and dining chairs amply upholstered in latte-coloured leather, this elegantly unusual dining room, discreetly illuminated with down-lighters embedded in the arched brickwork of the ceiling, is a remnant of the horse tunnel that once connected Camden Goods Depot to the stables. The restaurant is perched hard by the Regent’s Canal towpath, a short walk from Camden Lock, but should you approach from the towpath, give the metal steps up to Gloucester Avenue a miss and take instead the gently inclined footpath up from the canal. It will bring you out in the restaurant courtyard, where on sunny days white-clothed tables are invitingly laid around an ancient olive tree of enormous girth. Mosaic adorning the brickwork of its raised bed is indication of the hedonistic Mediterranean mode now prevailing at Sardo Canale. The tree was shipped here from Sardinia when the restaurant opened in 2004. Pea-sized golden beads of pasta called fregola are a Sardinian speciality, particularly popular with seafood and available locally from Parkway Delicatessen at 30 Parkway. To cook, you toast them with oil and garlic before adding hot stock to soften and swell them, just like cooking risotto. Fish stock is easy and cheap to make in quantities larger than you need for this dish. Strain and freeze the surplus for restaurant-standard fish soups and sauces. First make the stock. Put chopped onion and carrot into a large pot and add the white wine and 2 litres cold water. Bring to the boil, add salt and cook at a low boil for 30mins then strain through a fine sieve and set the broth aside until you are ready to cook the fregola. Put half the garlic into a large pan with 1tbsp oil, fry briefly, then add prawns and cook on both sides. Add squid, mussels, clams and courgette slices to the pan and shake over heat for a minute or two, then pour on wine, cover the pan with a lid, lower the heat and cook until the mussels and clams open. Meanwhile put remaining 1 tablespoon of oil and garlic in another pan, add the fregola and shake or stir over heat for 2-3minutes until it is golden and smells toasted. Sprinkle chillies over, add all the liquid from the fish pan and cook the fregola, adding hot fish stock in batches as each batch is absorbed. Add the fish to heat through for the last few minutes before the fregola is al dente. 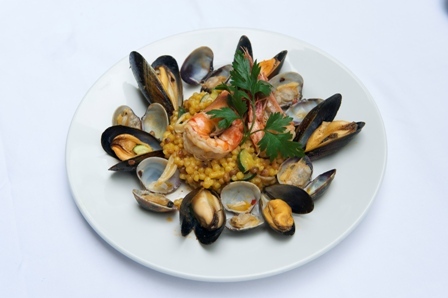 Season with salt and 1tsp extra virgin olive oil and arrange fregola on warm plates surrounded by mussels and clams, topping each serving with a couple of large prawns. Sprinkle lightly with chopped parsley and serve.